ability to adapt, to change, to evolve. some very lovely silver linings for those brave enough to persist through them. not be too proud for alternatives. first leap, but wise enough to know when I shouldn’t throw all my caution to the wind. That is my wish for myself. For my daughter. And for us all. versatile as even the loftiest of ideals. onions and sauté until the onions are soft and translucent. thoroughly in the oil and softened onions. been infused with its earthy aroma. aside to cool a bit. and process until you reach your desired consistency for the sauce. I like my sauce thick and chunky. Thin with water or stock if needed. Set aside. – Mix the flour, salt, and pepper on a plate. Dredge the pork steaks in the flour. 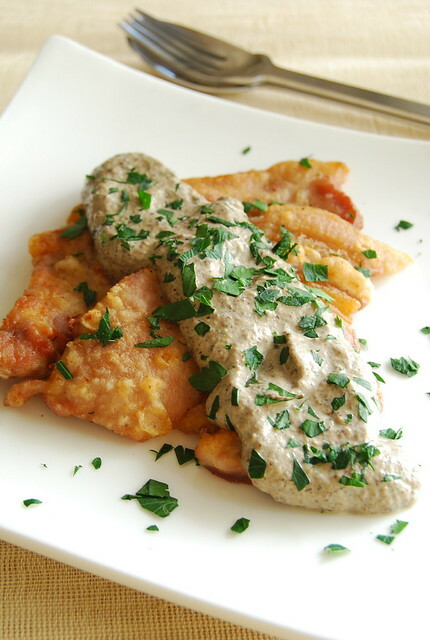 the pan – fry the pork steaks in batches if necessary. garnish with more chopped parsley if you’d like. is something that C prefers. for a mushroom soup in your future. tucked into a grilled cheese sandwich. It can also be used as a base for a quick mushroom soup. to make the absolute most of them! Joey – is that pork belly I spy with my little eye…? I have a pork steak in the freezer, and mushrooms in the fridge. I shall proceed accordingly. Definitely a gorgeous thing to eat on a rainy evening! Hi Ling! It's a cut they call pork steak or pork cutlet at my grocery…basically a pork chop without the bone (but with the fat as you so cleverly noticed! ), and a bit thinner. Fat-trimming is not too big over here…hehehe! Hope you enjoy this! This post is a breathe of fresh air. It was a delight reading your "philosophizing" and that pork steak appears to aspire mouth watering goodness. I look forward to the next post and trying your recipe out. Hi Shalum! Sigh…don't we all? 🙂 Love chunky sauces too! Hi Katiez! We eat a lot of pork over here too! Hi there! I just discovered your amazing food blog, and I love it! There are so many recipes I want to try! Yummy! This I should try at home. Thank you for this blog!